On Thursday I shared my Jazzed up Cottage Cheese recipe which added a variety of veggies to be cut brunoise style. I had quite a few people comment on my post as well as sending me emails regarding this method. Some even asked me to show them “How to Cut Brunoise Style” in a video. I’ve been working lately to decipher just how to use my DSLR to create a video. It’s been a challenge and that’s why you haven’t seen as many videos from me lately. However, I decided to create a video using my iPhone showing those of you unfamiliar with how to cut brunoise style, just how it’s done. I decided to work with a carrot since that is always the most challenging vegetable since it’s round. Once you get the hang of cutting a carrot brunoise style the others will be easy. While there are gadgets that will do this for you, I personally find it fun to cut my own. Plus the more you practice, the better and quicker you’ll become. Below are the step by step instructions with my video to follow. Please let me know if you have any questions, I’m always happy to answer them. Cut top & bottom of carrot, then peel outer layer of carrot and rinse. Pat dry. 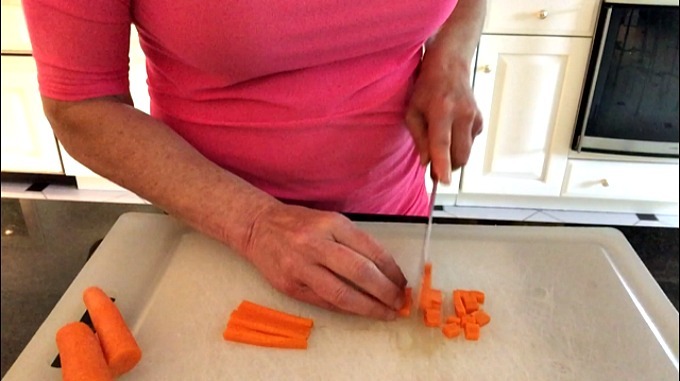 Cut carrot into 3 sections, horizontally. Set aside all but one. 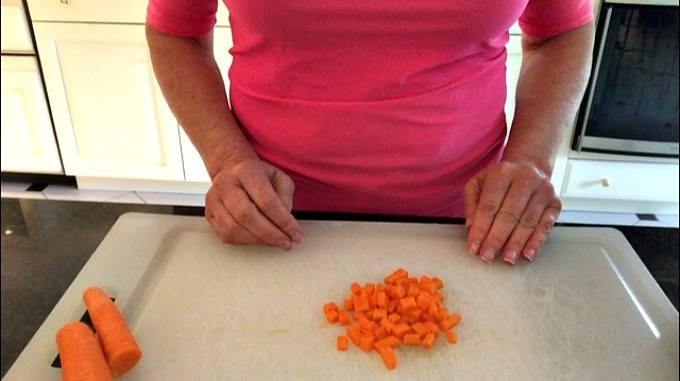 Since the carrot is round you will need to carefully cut a thin slice from one side vertically. Turn the now flat side on the surface. You’ll notice it’s stable now. Repeat with the other 3 sides until you’ve squared off all sides, and have a long rectangle. Carefully make about 1/8-inch slices vertically, setting each vertical slice aside until you finished cutting through the carrot. Take each vertical slice (about 1/8-inch thickness) and slice into 1/8-inch julienne strips. (You can do this larger if you like based on the size of the vegetable, fruit or ingredient you’re using, making sure both cuts are similar thickness). You may be tempted to do all at the same time by stacking them. However, it is best to do each vertical strip individually to insure even cuts, and that the knife doesn’t slip. Once you’ve cut the julienne strips, gather several strips together lying side by side. Line one side of the tips up with the edge of your knife. Cut through all at the same time starting at one edge, insuring to cut the same thickness as steps 4 and 5. Continue gathering up small batches of julienne strips that are manageable to handle making more cuts. Once you’ve completed all the cutting you will see what you’ve created are Brunoise style cuts. This same method can be done using all veggies, fruit, or other ingredients that you wish to cut into smaller even diced pieces. 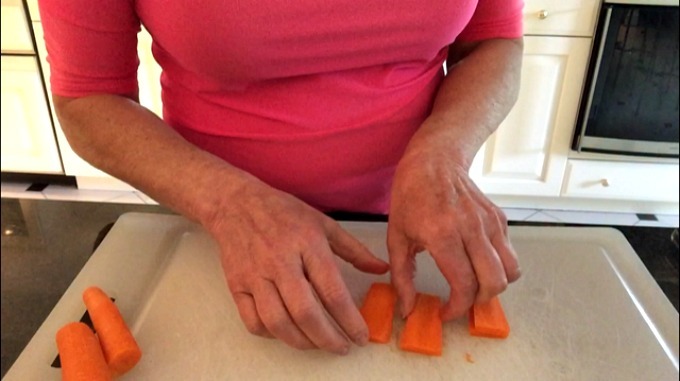 The carrot or other round veggies are the most challenging – that’s why I demonstrated those. Now that you’ve mastered How to Cut a Carrot Brunoise Style all other ingredients will be easy to cut this way. Now go ahead and try this on your own. Please get back to me and let me know how it went! You’ll soon become so quick at creating the Brunoise Style Cut you’ll impress your family and friends. Just remember to be sure you’re always using a sharp knife. A dull knife is an accident waiting to happen. Awesome! Thanks for sharing, Vicki. Anytime Angie. It’s so much fun to do especially once you get the hang of it. Try it out if you’ve never done that cut before and let me know. It’s addicting! I agree, same here. Once you know how to do the different cuts it’s fun. The more you do them the better you get and quicker! I love watching your technique. First thought was that I definitely need to sharpen my knives. Thanks for the demo! Thanks Liz. I’m glad you enjoyed watching this technique. It’s not my technique but one that’s been around for as long as I can remember. It’s fun to learn and the more you practice the better it will be and the quicker you’ll be able to create it. Yes definitely be sure your knives are sharp!